"French Lentil, Golden Beet Salad." It just sounds nice, doesn't it? For me, eating salads of grains, legumes, fruits and vegetables is a sure sign that there's lightness just around the corner. The leaves are returning to branches, flowers adorn every sidewalk crack in town and the birds, they are nesting on our porch. A big breath of fresh air has entered our home, spirit and tummy. All I want is picnic faire -- baguettes, lemonade, olives and salads, to be exact. Does the season affect you and the way you eat so vividly as it does me? Of course, desserts, teas and coffees are just the thing year-round and my penchants for all of the above hasn't skipped a beat! Preheat oven to 400. In a large roasting pan, spread the beets evenly and toss in a little olive oil. Cook for about 15 minutes. Add lentils and 3 cups of water, cover with foil and return to the oven for another 30 minutes, or until lentils are done. In the meantime, make the vinaigrette. In a large bowl, whisk the olive oil, lemon, capers, shallots, mustard, honey, salt and pepper and fresh herbs. Set aside. 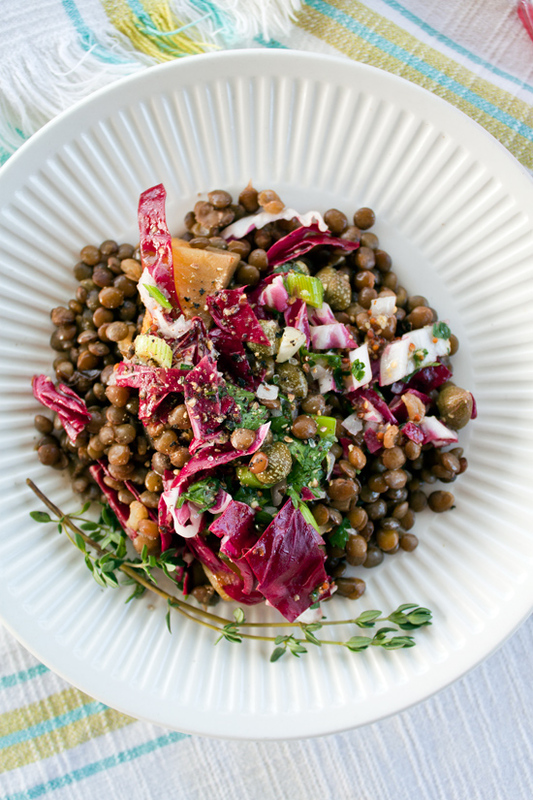 When lentils are done, dress with vinaigrette, sprinkle herbs and radicchio, and stir to incorporate. Season with salt and pepper, adjusting acid and oils to your taste. This salad is better the next day, when flavors have fully melded, but is delicious eaten straight away. Serve with crackers, great bread or another green salad. Enjoy. thanks girl! it is so tasty and easy. Beets are my favorite thing in the world....I will definitely try this recipe when I have access to all the ingredients. I saw this little blurb on the food network about the ten healthiest foods. Lentils and beets made the list! Along with one of your favorites, avocado! This does look delicious. I love the use of potent mustard. I'm on a raw vegan "cleanse" now, and it's incredible...but the day I'm done, I'm making this! Delicious salad! Besides its great aspect, the taste is delicious! looks amazing! great combo of textures. can't wait to try. i've already bookmarked it with my cookmarked.com account! yum! my friend made this for my birthday and it was SOOO good. I woudln't have thought to combine these ingredients or to cook lentils this way... I just made it - I had to add more water (I used 3/4 cup of black "beluga" lentils instead of puy and 1.5 cups water but I added another 1 cup water after 30 mins as I like my lentils tender and not too chewy (or should i say my GUTS don't :). I had to stop myself from eating all the beets and lentils before they cooled enough to add to the salad! the beet juice seeps in and sweetens them - so good. I am going to make hot baked beets and lentils as a side dish again too. OMG, this salad is sooooooo delicious. I made a variation of the recipe using golden beets, yukon potatoes and carrots. I made A LOT. Then we tried it right out of the oven before it became a salad. Delicious like this too. Then I substituted red cabbage for the raddichio since I was too lazy to go shopping today. This is really good. So sorry I messed with the recipe but it goes to show you that you can make it with what you have on hand. I'm taking the salad to a vegan and locally grown co-op 'meet-up' this evening. Thank you so much! !